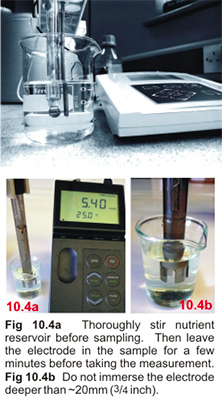 pH meters employing a glass electrode are useful for precise pH measurement in nutrient solutions. However, for reliable performance they do require proper storage, handling and frequent calibration. Step 1. Calibrate the meter. Step 2. Sample preparation: Stir the nutrient reservoir thoroughly before sampling, especially after pH Up or pH Down is used. Ensure the sampling container is clean by rinsing a few times with the nutrient solution. ● When the pH electrode is first placed in a sample, it is common for the reading to vary for some time (maybe several minutes) before resting on a final/correct value**. Ensure to give enough time for the reading to stabilize (Fig 10.4a). However, note the exceptions in the section “Preventing electrode contamination”. ** This can take several minutes especially if the sample’s temperature is significantly different from ambient. ● Do not immerse the electrode in the sample to a depth that exceeds the level of the filling solution inside of the electrode (Fig 10.4b). Since it is not possible to view the depth of the filling solution (gel) in many pocket sized meters, immerse the electrode to a depth of no more than ~20mm (3/4 inch). Exceeding this depth causes the sample solution to weep back into the electrode itself. This will damage the electrode and cause inaccurate readings. Step 4. If the pH is not between 5.0 and 6.5, adjust the pH of the nutrient reservoir. Step 5. When complete, rinse the electrode with distilled water. For further information see “pH electrode contamination”. Step 6. Store the electrode in a proper storage solution when not in use. For further information see “Dry storage of pH electrodes”.